In the seventh pAsuram, when the parrots asked parAnguSa nAyaki “how can we identify him?”, she explains them his characteristics and tells them “you locate him clearly as per these characteristics and inform him about me on my behalf”. Subsequently, parAnguSa nAyaki sends a parrot towards emperumAn who is having exclusively beautiful characteristics. Oh parrot who is having physical beauty which makes you comparable to him! You go in a straight way to thiruvaNvaNdUr which is surrounded by garden which is creating beautiful flowers which compete with each other and enter the town which is having reddish periods [during sun rise and sun set]; emperumAn is present with the characteristics such as a blackish form and reddish mouth, eyes, hands and feet; he is having the enjoyable divine chakra which is having enmity towards the enemies of those who are engaged in enjoying him and the SrI pAnchajanya; seeing him in front of you, please tell a word on behalf of me who am waiting to see that form. oru vaNNam senRu pukku – Two explanations are mercifully given for this. [bhattar’s view] If you go there [just for your enjoyment] forgetting my separation, great elders will be present; they will beat you with canes; you have to tolerate that and enter in there. Alternative explanation [previous AchAryas’ view] – there are many enjoyable aspects enroute; entering in there instead of getting attracted towards those. SrI rAmAyaNam ayOdhyA kANdam 19.1 “sathadhantha:pura dhvAram samathIthya” (sumanthra walked through the familiar private quarters which is filled with people). As said in periya thirumadal “ponniyalumAdak kadandhu pukku” (passing through the golden mansions). SrI rAmAyaNam ayOdhyA kANdam 68.14 “sarAmsi cha supullAni nadhIScha vimalOdhakA: | nirIkshamANA …” (Focussed on their task they walked through the ponds which have blossomed flowers and the fresh water rivers). kAryavaSAth jagmu: – they were walking focussed on their task. Since there is abundance of enjoyment, entering in there without getting attracted in this will be very difficult. enakku – Am I in a state that you can worry about getting insulted there? As said in SrI rAmAyaNam AraNya kANdam 6.16 “Ehi paSya SarIrANi” (rishis to SrI rAma – See our bodies which are botched by the rAkshasas) and as in SrI rAmAyaNam yudhdha kANdam 17.17 “nivEdhayatha mAm” (vibhIshaNAzhwAn telling sugrIva – please inform about me to SrI rAma), parAnguSa nAyaki is showing her [weakened] form. After seeing me, are you interested in the enjoyment or are you worrying about getting insulted there? Can those who are engaged in helping others, worry about such aspects? onRurai – You tell one word. Alternative explanation – I am telling this due to my anguish; he is of the nature that it is extraneous to inform him more than once. It is just that he is immersed in the enjoyment there. Once he knows that I am (parAnguSa nAyaki) suffering, neither he can enjoy nor he can refuse to come to me. enakku onRu urai – You tell one thing about my situation/purpose. oN kiLiyE – You are similar to him in his appearance, that is, your childishness, sweet talks, reddish mouth, and greenish form; instead of seeing and enjoying you, I am going to lose you as well [since you too will remain there seeing the enjoyment there]. seru oN pUm pozhil sUzh – Surrounded by flower garden which causes fights. For the couples there, there is constant suspicion. That is – there will be constant fights between the couples saying “instead of seeing me, you are satisfied in seeing the flower; you plucked the flowers which I was planning to pluck; even before I embraced you, nice fragrance is smelt on your body”. Also explained as the plants rubbing with each other and making flowers blossom as said in periya thirumozhi 3.9.1 “salam koNdu malar soriyum” (absorbing the water and giving out the flowers). chekkar vElaith thiruvaNvaNdUr – Having a reddish shade due to the pollens and colours from the flowers which has fallen on the sand banks. Since it is the seashore, it is explained to be having the sand. All of these imply that the town is having the qualities for enjoyment. karu vaNNam – This is the nature of the form which accepted parAnguSa nAyaki exclusively. seyya vAy – To make the form look extraneous, the divine lips which are ready to say “I am for you”. seyya kaN – The divine eyes which indicates “it is not just said for the sake of it, even internally I feel that way”. The divine eyes are the ones which reveal what is inside. The hands which put such thoughts into action [by embrace etc]. The divine feet, where one falls after being captivated with these features. seru oN chakkaram sangu – The divine weapons which protect and nurture such beauty, doubting where it is unnecessary and attacking the enemies by leaving his hands [chakra], and being close without ever leaving the hands to protect [Sanka]. The divine weapons which mesmerises those who see them as said in periya thirumozhi 10.10.9 “innAr enRaRiyEn” (I don’t know who he is). adaiyALam – Just like the divine limbs, his divine weapons too are exclusive symbols of him. SrI rAmAyaNam sundhara kANdam 34.3 “yAni rAmasya chihnAni lakshmaNasya cha yAnivai” (I have seen the features of SrI rAma and lakshmaNa. Listen to me). thirundhak kaNdE – Unlike me who is seeing everything through my internal vision, you see them through your external eyes. 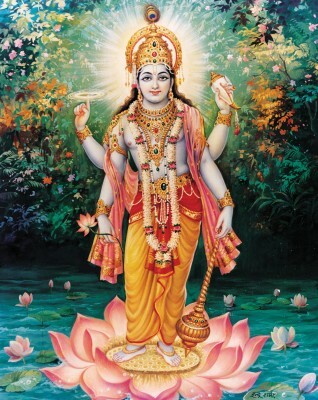 In bhagavAn, the vision is the result [vishNu sUktham – “sadhA paSyanthi sUraya:” (the nithyasUris are constantly seeing him)]. You have got it before me. When engaged in serving sIthAp pirAtti [in being the messenger], he got the result before her. SrI rAmAyaNam yudhdha kANdam 1.13 “parishvangO hanumatha:” (SrI rAma embraced hanuman). thirundhak kaNdE – To remove all the anguish in seeing my pale complexion [due to suffering in separation], you will see the form which remains unchanged in union and separation. It is not just said in SrIvishNu purANam 1.2.1 “sadhaikarUpa rUpAya” (one who is having unchanging divine auspicious form) for the sake of saying [praising], but you will practically see the form which manifests such quality. This entry was posted in thiruvAimozhi, thiruvAimozhi 6th centum on October 16, 2017 by Sarathy Thothathri. Grateful for the post and the lucid commentaries! May your Service continue with more and more His blessings! !